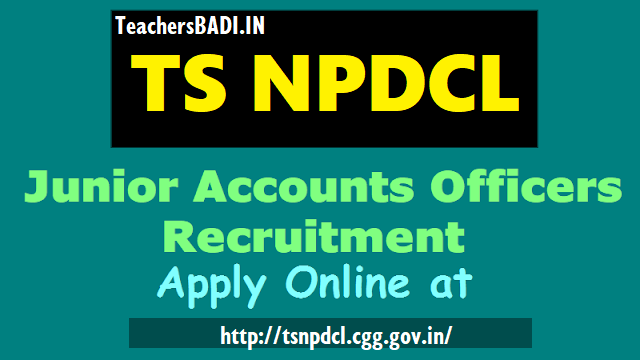 TSNPDCL JAO Posts 2018: TSNPDCL has given give the Junior Accounts Officerr Posts 2018 Recruitment Notification and Northern Power Distribution Company of Telangana Ltd (TSNPDCL) would invite #onlineapplications from the eligible and qualified candidates for the post of Assistant Engineer (Electrical.,Electronics and Civil). Applications are invited On-line from qualified candidates through proforma application to be made available on http://tsnpdcl.cgg.gov.in website to the post of Junior Accounts Officer. The TSNPDCL Company caters to supply of electricity in districts of Mancherial, Nirmal, Kumram Bheem, Kamareddy, Peddapalli, Jagtial, Rajanna Siricilla, Warangal Urban, Warangal Rural, Mahabubabad, Prof Jayashankar, Jangaon, Bhadradri Kothagudem, Adilabad, Nizamabad, Karimnagar and Khammam Districts. Minimum 18 years and maximum 44 years. The age is reckoned as on 01.01.2018. AGE RELAXATION : As per the G.O.Ms.No.190 GA (Ser.A) Dept., Dt:08-08-2017 as adopted by TSNPDCL vide N.O.O. (CGM-HRD) Ms.No.194,dt.13.09.2017, the Upper age limit is raised up to 10 years i.e., from 34 to 44 years. The following percentages of reservations are applicable subject to the orders of the Government from time to time. BC-25% + 4% Reservation to BC-E group will be subject to the adjudication of the litigation before the Hon’ble Courts including final orders in Civil Appeal No. (a) 2628-2637 of 2010 in SLP.No.7388-97 of 2010 dated 25.03.2010 and orders from the Government. Mode of Payment of fee : Candidate has to visit the website http://tsnpdcl.cgg.gov.in to view the detailed notification and User Guide. The fee mentioned at Para- I (5)(a) is to be paid online by visiting the website and click on the link MAKE PAYMENT in the website duly following online instructions. Failure to pay the examination fee, application fee wherever applicable will entail the total rejection of application. The written test comprising of 100 marks consisting of 100 multiple choice questions and each question carries 1 mark. The section A consisting of 80 questions on core Accounts subject and the section B consisting of 20 questions on General Awareness and Numerical Ability. i) The selection of candidate for appointment will be made 100% on written examination only. There will be no interview. ii) Only those candidates who qualify in the written examination by being ranked high, will be called for verification of Original Certificates in 1:1 ratio duly following Rule of Reservation and Spirit of presidential order. Mere securing minimum qualifying marks doesn’t vest any right to a candidate for being called for verification of Original Certificates or for appointment. I Step: Payment of Fee: The Applicant should pay the prescribed Fee as per the notification as detailed above and obtain Fee paid receipt with Journal Number (12 digit) in the first instance. The written examination for recruitment of Junior Accounts Officer will be held on 22-7-2018 from 10.30 AM to 12.30 PM.